Birthdays are an excuse to remind yourself of what life is all about: doing unforgettable things with amazing people in incredible places. And as more and more people continue to see the value of spending their money on transformational experiences instead of material things, group birthday trips are growing in popularity every year. They’re also a great way to remind yourself of one of our favourite quotes “growing old is mandatory, but growing up is optional” – Walt Disney. You bring the friends and we’ll bring the chef, the helicopter and the cake! If you’re a skier in BC you’ve probably spent a few birthdays weekends (for yourself or other people) at your local ski resort. Resorts come with the benefit of having everything in one location and usually have exclusive upscale bars and restaurants perfect for a birthday celebration. But here’s the thing, as British Columbian resorts continue to attract more visitors from overseas locals are feeling the effects of overcrowding and the ever-increasing costs of lift tickets, not to mention the resort-priced restaurant dinners and drinks. So, this year, why not leave the crowds behind and trade a resort trip for a few days in a private backcountry lodge in the most western reaches of the Canadian Rockies. The Mallard Mountain Lodge sleeps a maximum of 8 people. You can ski fresh lines and first descents all week in the surrounding 18,885 acres without ever seeing another person who isn’t there for your birthday celebration. We have a fully stocked kitchen with gas stove and have professional chefs on call, so you can really take a break and celebrate in style. Good to know: our helicopter take off area is only a 3.5-hour drive from Kamloops and 6.5 hours drive from Vancouver. As much as 95% of the 5 valleys that surround the Mallard Mountain Lodge has never been skied before, by anyone. We were the first people in this area when we built the lodge. Unlike the public backcountry huts and cabins in BC, only our guests have use of our private alpine lodge. Have you ever noticed that birthday cakes never get old? No matter what your age everyone loves a delicious cake! Don’t worry about trying to discreetly pack a surprise birthday cake in your luggage, we’ve got you covered. From chocolate brownies with a cherry glaze to lemon ginger pound cake, or good old birthday cupcakes and sprinkles, just let us know your favourite cake or dessert and we’ll bring in all the ingredients and make it fresh on the day. Plus, the less cake you have to carry the more wine you can bring to celebrate! 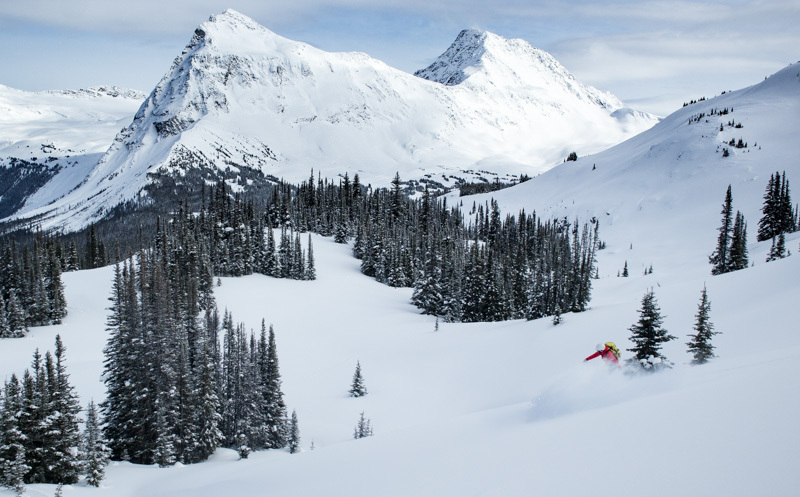 Close enough to the Monashees to still get those legendary BC snow dumps, but far enough into the Rockies for it to fall as the world-renowned “champagne powder”. We’re in a Goldilocks zone here at the Mallard Mountain Lodge and the best part is that it’s yours. Once you arrive at the lodge there is no mechanised activity – no cats, no helicopters, no snowmobiles – and the constantly low temps means that days, even weeks, after a storm there are pockets of untouched powder all over and within a short walk from the lodge. Do you have a birthday goal or a slope that you’d really like to ski or ride? Hiring one of our experienced professional guides is a sure fire way to bag the most peaks and secret stashes during your stay. Our staff set the up-tracks to all the most popular places in the main valley, making uphill travel as quick and easy as possible – although, out here the journey is as much a part of your trip as the destination! Birthdays are the best excuse to treat yourself (or someone else) to an experience you may never normally do. We have teamed up with some of the region’s best professional guides to deliver an AT 101 Intro To Alpine Touring Program that is designed for people who have either never been in the backcountry before or who would like to refresh their avalanche rescue and terrain management skills under the guidance of a professional. If you’re new to backcountry skiing or snowboarding this is the perfect ski touring experience for you! The Canadian Rocky Mountains are legendary. Their distinctly rugged and prehistoric features combined with light, dry snow lures skiers and snowboarders from all over the world. But, did you know that a small part of the Canadian Rockies is far enough west that it actually sits inside British Columbia? As a result, this area gets the best of both worlds: epic BC snow storms with precipitation that fall as delicate, light snow crystals instead of the bigger coastal flakes. CBC Vancouver meteorologist, Johanna Wagstaff, called British Columbia the “province of a thousand micro-climates” and this is one of the best! The Mallard Mountain Lodge is a 77km helicopter flight deep into the legendary mountains that border BC and Alberta. It takes about 30-minutes to reach our helicopter accessed lodge after taking off from the staging point in Valemount. On the East our tenure is flanked by Jasper Provincial Park and on the west the historic Canoe River and the Monashee Mountains. If someone bought you a 30-minute helicopter ride for your birthday you’d be pretty impressed, right? Now imagine you got two and they sandwiched a 3, 4, or 7 days of incredible backcountry skiing or snowboarding from your own private lodge. With ski and stay packages at the Mallard Mountain Lodge starting at less than $2000 you’re basically getting the helicopter for free.